Holy Basil/ Tulsi, the “queen of herbs” is the most sacred of all the herbs found in India! This sacred plant is found in almost every Indian household. Tulsi has been used in India for around 5000 years and is acclaimed for its healing properties of the mind, body and spirit. Tulsi has been widely popular in South Asian countries for many centuries and now is also gaining popularity in the West. It is a tropical plant which grows as weed and also cultivated. Tulsi is worshipped by Hindus and is an important symbol of Hindu religion. It is a very common sight to find Tulsi Vrindavan ( A special structure where tulsi is grown) in houses of Hindus. It has been an age old custom in India to worship it two times a day, water it and light lamps near it, once in the morning and once in the evening. It was, and still is, believed to protect the whole family from evil and bring good luck. Basil leaves have also been an essential part of all worship ceremonies since ancient times. These practices are not superstitions and actually has sufficient scientific reasoning behind them. Keeping in view the ultra disinfectant and germicidal properties of this legendary herb, wise people then devised these customs to bring people into contact with this plant every day, so that they may keep safe from day-to-day infections. Recent research on tulsi confirm most of these beliefs. In the following paragraphs, we shall see why it definitely deserves to be worshiped. Marked by its strong aroma and astringent taste, it is regarded in Ayurveda as an “elixir of life” and is well known to promote longevity. It is because of these numerous benefits that “Tulsi medicinal plant” is worshiped as a goddess in India! In the case of acute fever, a decoction of the leaves boiled with cardamom powder in half a litre of water mixed with sugar and milk brings down the temperature. Chewing Tulsi leaves also cures cough and flu. It helps to mobilize mucous in bronchitis and asthma attacks. A decoction of leaves with honey and ginger is an effective remedy for bronchitis, asthma, influenza, and cold. A decoction of leaves, cloves and common salt also relieves influenza. Water boiled with tulsi leaves can be taken as a drink in case of a sore throat. You can also gargle with this water to soothe sore throat. 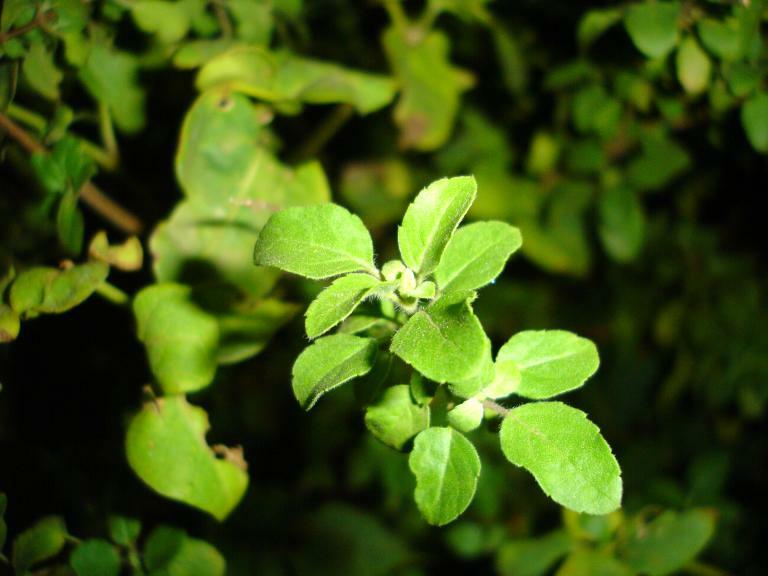 Tulsi is an important ingredient in the preparation of cough syrups and expectorant. A concoction made by boiling tulsi leaves in water can be taken as a drink or used for gargling to get relief from a sore throat. Vitamin-C and other antioxidants in Tulsi, apart from repairing damages done by free radicals, also minimize the stress caused by these oxidants. They soothe the nerves, lower blood pressure, reduce inflammation and thus reduce stress. One such component is Camphene. Potassium also reduces blood pressure-related stress by replacing sodium and loosening the tense blood vessels. Tulsi is an excellent mouth freshener and oral disinfectant and its freshness lasts for a very long time. Holy Basil destroys more than 99% of the germs and bacteria in the mouth and this effect can last all day. It also cures ulcers in the mouth. Finally, it is also known to help inhibit the growth of oral cancer which can be caused by chewing tobacco. However, tulsi also has certain compounds like mercury, which has rich germicidal properties, that can actually be harmful for the teeth if kept in direct contact for too long. Therefore, it is advised to avoid chewing these leaves. It is actually discussed in holy books and Ayurvedic teachings that chewing these leaves robs them of their holiness. However, it has no harm if you do not chew it or consume its decoction. Basil leaves taken with home-made fresh curd help in reducing excess weight and fight laziness by renewing your energy levels and facilitating new blood cells formation. Tulsi is anti-carcinogenic in nature and helps to treat some forms of cancer like breast cancer. Tulsi restricts the blood vessels that feed tumors. It also helps to inhibit the growth of oral cancer that is caused due to tobacco. But Tulsi should not be used as a sole treatment of cancer however. The leaves are also useful in treating gum disorders. Tulsi leaves dried and powdered can be used for brushing teeth. It can also be mixed with mustard oil and can be used as a toothpaste. It maintains the health of the gums and helps to counteract pyorrhoea and other dental problems. This toothpaste can also be rubbed on the gums to hinder gum inflammation. Bad breath can be detrimental to your self-confidence. Tulsi leaves can be a healthy substitute to special toothpastes and chewing gums to ward off bad breath. You can chew a handful of tulsi leaves to prevent bad breath. Tulsi leaves are considered a great medicine for headaches. A facial steam of dried tulsi leaf is effective in alleviating headache. For this purpose, add a tablespoon of dried tulsi leaves to 2 cups of water in a large pot. Covering your head with a towel, carefully lean over the pot and breathe in the steam for 5 to 10 minutes. You can also apply pounded basil leaves mixed in sandalwood paste on your forehead to get relief from heat and headache as well as cooling effect in general. Basil leaves prevent the outburst of acne and pimples as they purify your blood by removing toxins. They contain antibacterial and antifungal agents and you can apply a paste of these leaves mixed with sandalwood paste, neem paste or rose water to prevent inflammation. Tulsi leaves contain antibacterial and antifungal compounds. A paste made of Tulsi leaves along with sandalwood paste and rose water can be applied on the face as it helps to prevent inflammation. Hair loss is a common problem which can occur due to itchiness and sweatiness of scalp. You can make a paste of tulsi leaves and add it to your hair oil. Applying this oil on your scalp will keep your scalp cool, reduce itchiness and promote hair growth by improving circulation in your scalp. Add a small quantity of Tulsi oil to regular carrier oil like coconut oil and massage well on your scalp. Tulsi helps to improve the blood circulation and keeps your scalp cool reducing itchiness and dandruff and thus promotes hair growth. You can also apply Tulsi paste which keeps the scalp, roots clean and keeps the dandruff at bay. For this purpose, soak dried tulsi leaves powder and amla powder in water overnight and wash your hair with it after straining it the next morning. This prevents graying of hair as well as hair fall.